Seductive Marilyn Monroe, extraordinary Amy Winehouse and affecting Audrey Hepburn - is there anything uniting these talented women, except their unique fashion sense and beauty? Love for dramatic cat eyeliner! These ladies mastered the eyeliner art and loved wearing thick black wings on their eyelids. An ideal fleek beautifully prolongates the eyes and makes them bigger and sexier. But incorrectly applied eyeliner can completely ruin even the most beautiful makeup look. It is very easy to screw up the desired neat and sharp eyeliner look, but let's not talk too much about the negative aspects, but focus on the brighter side. There is an effective makeup hack, that will help you reach long-awaited perfectly shaped and neatly applied eyeliner. All you need to nail the look is a silicone brush that you use to apply nourishing facial masks. Silicone face brush has a slightly curved shaped and it is easy to manipulate the brush while drawing an outline. So here is a little step by step tutorial, which hopefully will guide you through the process of creating your perfect cat eye makeup. The very first and crucial step in eye makeup - eyeshadow primer. Use a small amount of your favorite eyeshadow primer and evenly spread it all over the lid. Let the primer absorb and work its magic on your eyes. Take the silicone brush and softly lean it to the outer corner of your eye. An ideal eyeliner fleek should start from the corner of your eyelid and visually continuing the trajectory of your bottom lash line come upwards, aiming the end of your eyebrow. That's how you should place the curved part of the silicone brush. Bold cat wing is rarely drawn with one light swipe of eyeliner brush. Pick up a tiny amount of product with your brush and draw a thin outline. Let the shape of the silicone brush guide your hand. Don't make it too thick, later you will improve the size and shape of the wing. Put the silicone brush away, it's done a great job! Pick up just a little more product and correct the length of the fleek, making it longer or curvier if it is necessary. 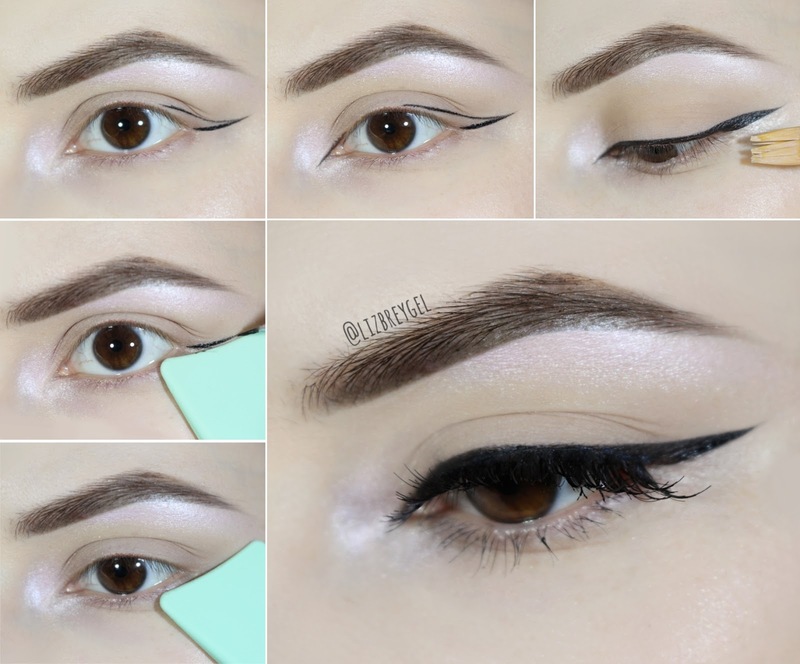 Connect the end of the line with the corner of your eye lid, creating a tiny triangle. Keep the moves of your hand confident or you might disrupt the line. Continue to line the upper lash line, filling in the blank spaces between the lashes. 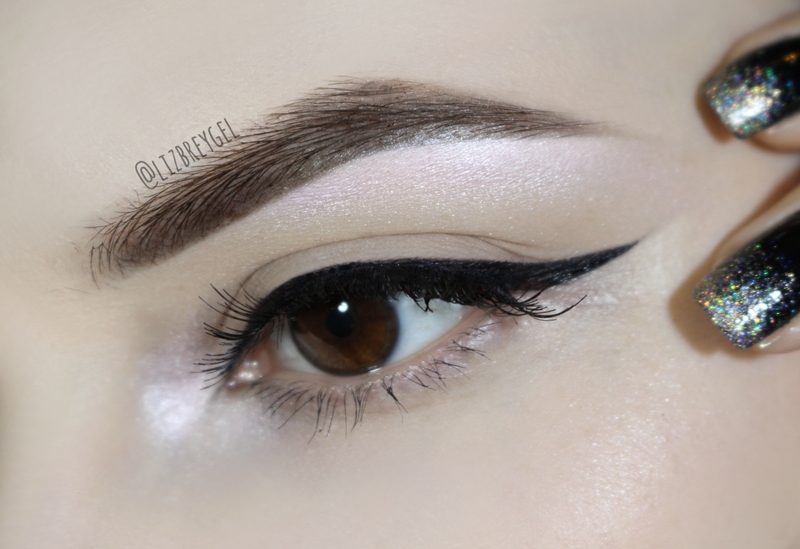 I like to line my eyes backwards, starting from the wing and drawing towards the inner corner of the eye. The thickness of the line should escalate from a very thin point into a broad wing. Finally, clean up any possible mess and neat the eyeliner wing with the help of thin synthetic brush and concealer. To make the line even bolder tightline the upper waterline with black eye kohl. Curl the lashes and finish your makeup with a generous coat of mascara. Voilà, your eyeliner is on-point! Drawing an ideal eyeliner wing is very complicated for a beginner, but every new wing will turn out much better than previous. Practice makes your makeup perfect! I hope this little guide will be somehow useful and help you acquire the eyeliner skill. Please let me know if you have any questions regarding this bold eyeliner tutorial. I'll be waiting for your comments. Until next time, lovelies!